Featuring a wide array of designs and colors from around the world, the pottery at Shoal Creek Nursery has a selection to fit any style of landscaping. Use it to brighten up decks, patios, gardens, front porches and even indoors. The variety of color options will provide a beautiful foundation for planting brilliant flowering annuals and perennials, small shrubs, ornamental trees or grasses. Create groupings of one or multiple colors or textures to add diversity to your landscaping. 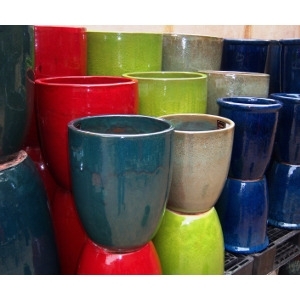 There are several sizes of pots for most styles. Keep in mind that the perfect pottery arrangement can do wonders for a space as you consider how to beautify your outdoor surroundings.